Ditto is a feature-rich extension portable tool that adds the standard copy-paste mechanism, saving each item placed on the clipboard to a dynamic list, allowing you access to anything copied or cut. Ditto allows you to save any type of information that can be put on the standard Windows clipboard and preview in before pasting. The program includes many customizations and the interface can be modified via available themes. Additionally, the program can communicate with other computers over a network to keep clipboards in sync. No need to install this tool. Portable Ditto is a lightweight software application built specifically for helping you enhance your clipboard functionality and manage multiple entries at the same time. You can copy it on any USB flash drive or other devices, and take it with you whenever you need to manage your clipboard content efficiently, without having to go through installation steps. This unobtrusive tool runs quietly in the system tray until called upon when it reveals several configuration settings to tinker with. It automatically records each clipboard entry and saves it into its panel, so you can easily access each copied text. Portable Ditto offers support for text, image, and HTML data, and you are allowed to group the items in user-defined categories, synchronize the clipboard content for multiple computers, encrypt data when is sent over the network, as well as display thumbnails of the copied photos in the list. 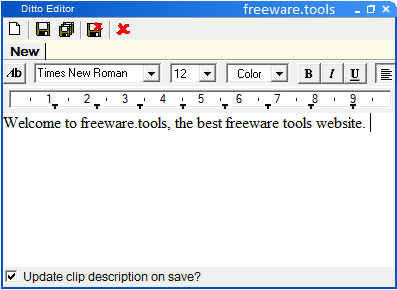 One of the best features bundled in this utility is a smart editor which enables you to alter each clipboard item. You can type in new text messages, customize the text in terms of font, size, color, and alignment, and insert bulleted information. Last but not least, you can assign hotkeys for each item copied to the clipboard, so you can easily paste it into other third-party apps, run the program at Windows startup, allow duplicates, play sound notifications, and limit the number of saved items. Portable Ditto carries out a task very quickly, and no errors show up with the entire process. It leaves a minimal footprint on system resources, so the overall performance of the computer is not hampered. As a conclusion, Portable Ditto proves to be a reliable clipboard manager that comprises a handy set of tools, and is suitable for beginners and professional alike.